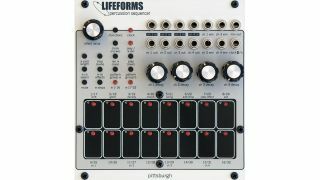 Pittsburgh Modular has announced the arrival of a new member of the Lifeforms family, the Percussion Sequencer, which gives you four channels of drum programming joy in the Eurorack format. We first the Lifeforms system at NAMM earlier this year, and it looked like it be the perfect gateway drug for any aspiring 'Euro-head'. Initially comprising the SV-1 synth and KB-1 controller modules, the Percussion Sequencer adds a 32-step beat sequencer designed for live performance. It uses an analogue envelope and VCA built into each channel to shape any audio source into a percussive instrument. On top of that, the module also includes six pattern effects: Shift, Glitch, Density, Morph, Swing and Add/Drop. The Lifeforms Percussion Sequencer is priced at $349, but there is no word on availability just yet. More information can be found on the Lifeforms mini-site.